With this week’s Boston Marathon tragedy, along with today’s ongoing news investigation all over both traditional and social media, it’s hard to avoid all of the heartbreaking and terrifying news. While my heart and thoughts go out to my family and friends in the City of Boston, I’d like to take a moment to share an upcoming event for this weekend with my bride-to-be and bridal party readers to enjoy a few hours to themselves to concentrate on the happier moments. The beautiful Hornblower New York and Lover.ly are partnering to inspire you in everything wedding related at this Sunday’s Journey of Love Wedding Showcase. As a professional bridesmaid I’m always out in the bridal trenches – gown shopping, attending fittings and stalking Etsy for goodies from veils to stationary. 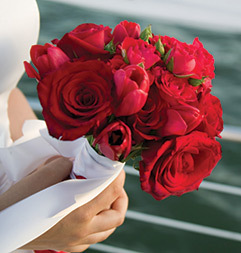 This Sunday, view an array of themed weddings while sipping on Prosecco and touring Hornblower Infinity. No matter where you’ll be tying the knot, you may just find exactly what you are looking for to plan the wedding of your dreams at this lovely event. This dockside event is aboard Hornblolwer Infinity with an open house from 2-6 pm. The day includes exclusive access to wedding vendors, a fashion show, free flowing beer, house wine and Prosecco (for your favorite single bridesmaid to make it through this afternoon with all smiles), gourmet hors d'oeuvres, cake and food tasting and giveaways.